The circuit of Lonato has lived a great weekend during the 2nd South Garda Karting Trophy, a highly spectacular event that brought on track 120 drivers coming from several European countries and that has proposed again the original sound of twenty years old karts in the joint round of the “KFA Nations Cup” for historic karts. The event also included national categories, Rotax’s for the North Area trophy and the 90s karts that offered a great spectacle on track re-proposing the unmistakable sound of the karts of that period. The “KFA Nations Cup” with the 100cc karts split in the two Classes – Pre2000 and Pre95 – made this weekend even more interesting in Lonato. On the podium of the absolute classification, two drivers followed their dad’s footsteps that funnily enough are as old as the karts they have been driving, that is twenty years old: Alessio Piccini, son of several times champion Alessandro Piccini, and Luca Corberi, son of the owner of the circuit of Lonato and former driver Marco Corberi. Alessio Piccini and Luca Corberi are works drivers for Tony Kart and respectively ended on the first and third step of the podium with two Tony karts of 1997, equipment built in their birth year. Davide Cattelani was second on a Top Kart-Iame, replica of the machinery used by former world champion Colin Brown. The most victorious driver, Alessandro Piccini, was eighth absolute. Class Pre95 was won by the Dane Kenneth Simonsen on CRG-Rotax. Due to the success of this event, this experience on historic karts will most probably be organized again in Lonato during the Autumn Trophy next October 1st. The national categories saw 60 Mini, KZ3 and KZ2 making it onto the track. The highest category, KZ2, was won by William Lanzeni on Ricciardo-Modena. Lanzeni claimed the pole position and then had the upper hand on Stefano De Vecchi (Formula K-Vortex), who won the Prefinal, as Mattia Lugli (BirelArt-Tm) rounded off the podium in P3. Luciano Medeghini (VRK-Tm), Jacopo Guidetti (VRK-Tm), Marco Cremaschi (CRG-Modena), Mattia Livraghi (BirelArt-Tm), Michele Fontana (EKS-Modena), Marco Valenti (CRG-Tm) and the Belgian Maxime Drion (CRG-Iame) completed the top ten of the Final. In KZ3, Marco Miastkowski took the win on Maranello-Tm after shining in qualifying. Miastkowski also secured the victory of class KZ3 Junior, while Vincenzo Alessio La Martina was second and winner of KZ3 Under on CRG-Tm. Gianni Corti, also on Maranello-Tm, was sixth absolute and won class KZ3 Over. The young Briton Mattew Rees won 60 Mini on Evokart-Tm, leading Hayden Lupifieri (Formula K-Tm) and Riccardo Ferrari (Croc-Tm). The Belgian Lorens Lecertua and Federico Strazzari, ended respectively in fourth and fifth place on CRG-Tm. Rotax categories have also been quite lively and competitive in their fourth round of the North Area. The victory of the Rotax Mini went to the Serbian Filip Jenic on EKS-Rotax, while Mattia Sergio Limena, also on EKS-Rotax, won Rotax Junior. 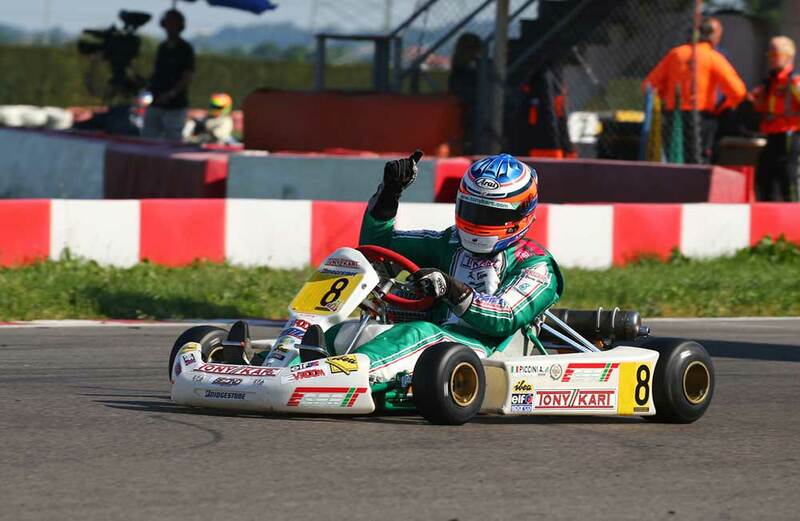 Filippo Laghi claimed the victory in Rotax Max, Cristian Trolese in Rotax Max Over, both on Tony Kart-Rotax. In Rotax DD2, the victory went to Armando Iannaccone on CRG-Rotax, as Alessandro Tosi won DD2 Over on GP Racing-Rotax.